My first Rapha purchase was a T-shirt, it’s dark green with a pleasant pink Rapha logo on the front… and it’s kept it’s shape over four years of regular wear… it may just be a T-shirt, but it’s a really good T-shirt. My second Rapha purchase was a Team Sky long sleeve jersey for my son, and boy was I jealous – more so when I found out that they’d sold out in my size! 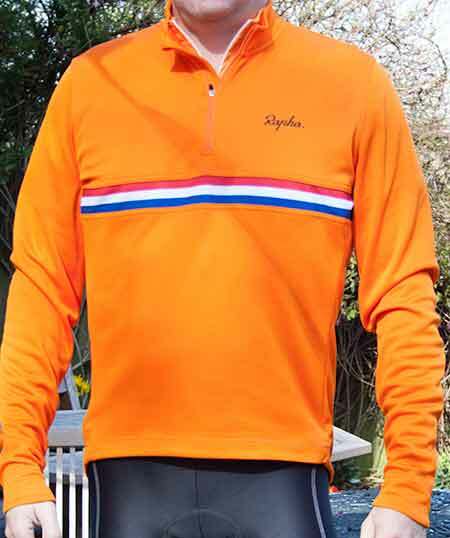 So this long sleeve country jersey was my first piece of proper Rapha cycling kit, and was part of the proceeds of having found an old Action Man Land Rover and cannon in the loft that sold for £150… that’s £150 for old, albeit much-loved, toys!! Anyway, I needed some decent three season kit and, having battled with a variety of different thermal layers, eventually conceded that the pro’s probably knew a thing or two, so went in search of the right kit. Having had a chance to try some Rapha jerseys at their London store last year, and then done the rounds of local bike shops looking at other options (Mavic, Sugoi), I cam full circle and went for the Rapha kit – on one simple premise, it fits beautifully. I’m not a racing snake by any means, so I was suprised at how well the jersey fitted – it’s long in the arms and the body, which in my experience is where most other brands fall short (excuse the pun). While fit should always be the main factor in determining whether an item of clothing is going to work as intended, the quality of the goods has to be second on the priority list, and Rapha were always going to tick those boxes. For a jersey to work through the coller months of the Spring and Autumn, as well as do some good service in the Winter, it needed to be thicker, and this jersey is a merino-mix that’s a bit heavier than most long sleeve jerseys. The attention to detail with Rapha products is often mocked, but they do make a difference… pump insert in the middle pocket, coin pocket to the right, easy zips, nothing over-engineered, just nice. The colour is as in your face as many people would want to get. 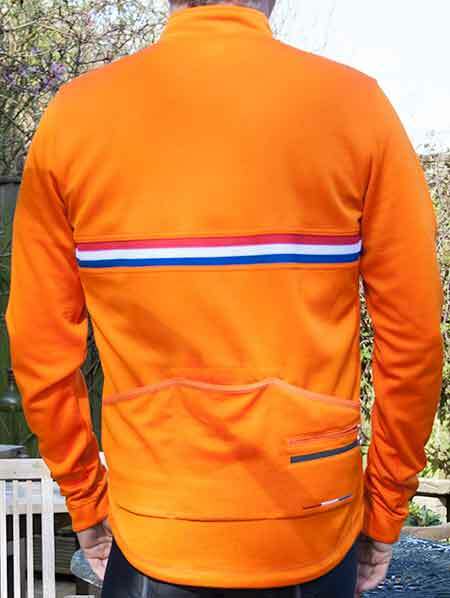 Although this is the Dutch flavoured jersey (they do a red Danish and blue American version as well), it was our long-standing support of the orange Basque Euskadi team that drew us to this country. I’ve done quite a few outings now in the jersey and the perfect match is a merino base layer , either long or short-sleeve depending on the whether. On a really damp and chilly start I matched it up with a Rapha wind jacket, but the jacket was in my back pocket after about 30 minutes – and on another ride I dispensed with the base layer and rode in the country jersey, which proved to be quite comfortable. All in, it’s proving to be a very versatile piece of kit.